NEW ORLEANS – Even though the collegiate track & field season ended three weeks ago, it didn’t stop the six finalists for The Bowerman in 2018 from continuing to break records. Votes poured in during The Bowerman Fan Vote for the most outstanding male and female athletes from the 2018 collegiate track & field campaign. More than 65,000 accepted votes were tallied for Arizona State’s Maggie Ewen, Kentucky’s Sydney McLaughlin or Georgia’s Keturah Orji, while more than 45,000 were tabulated on Florida’s Grant Holloway or the Southern California duo of Rai Benjamin and Michael Norman. By the close of the Fan Vote last Thursday night at 10 pm CT, Ewen and Holloway stood tall. Ewen and Holloway captured the Women’s Fan Vote and Men’s Fan Vote titles, respectively, giving them a leg up on the rest of the competition for collegiate track & field’s highest honor. If you’re wondering how Ewen and Holloway surged ahead, look no further. Fans turned out in droves for Ewen and Holloway on the final day of The Bowerman Fan Vote. Holloway and Ewen closed The Bowerman Fan Vote strong as the former hauled in 24.3 percent of his overall total last Thursday and Ewen reeled in 20.2 percent of hers. Holloway was a beneficiary of two other strong days as well. The Florida Gator topped the charts on the second day of voting – which accounted for 18.6 percent of his overall tally – and the penultimate day of the ballot – which accounted for another 18.6 percent of his tally – so there is a reason why he nabbed the second largest winning ratio in Men’s Fan Vote history behind Deon Lendore in 2014. Overall, The Bowerman Fan Vote picked up steam as it wore on – because once word got out, the numbers were staggering. 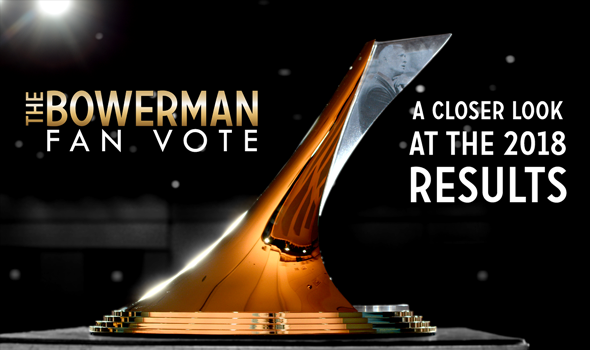 The final two days of The Bowerman Fan Vote were the largest in terms of percentage of total votes. There were 14,146 accepted votes on Wednesday, June 27 for 16 percent of the overall total and 18,818 accepted votes on Thursday, June 28 for 21.3 percent of that same number. Fan support is critical in collegiate track & field and The Bowerman Fan Vote certainly shows that. You can find out who wins The Bowerman on Thursday, December 20. That’s when The Bowerman Presentation will be held at the annual USTFCCCA Convention in San Antonio at the JW Marriot Hill Country Resort & Spa.